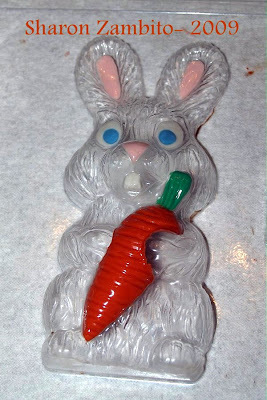 It just would not be Easter without chocolate bunnies, right? I just had to share with you these adorable chocolate boxes I made. I got the mold here. They are so cute filled up with candies. And you can eat the whole box! Gotta love that. 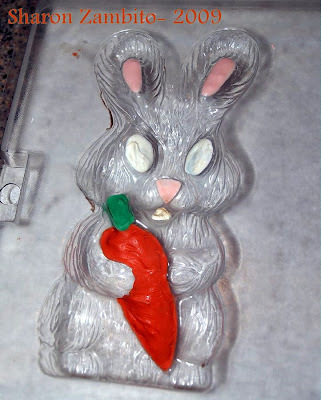 Paint the accent areas inside the mold with colored chocolate and a paint brush. It's easier to do if the chocolate is cooled off a bit and a bit stiffer. Don't be too worried about staying exactly in the lines. If you paint out of the lines, just let it air dry, and then use a toothpick to scrape off the excess where you don't want it to be. Use a soft brush to brush out all the "crumbs". Why not pop it in the fridge instead of waiting for it to air dry? 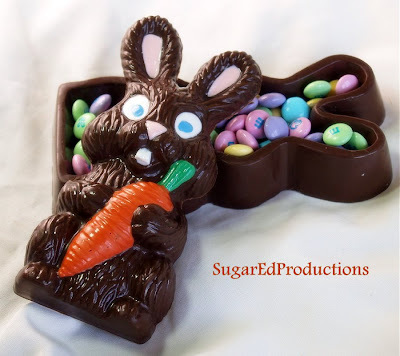 Because that will cause the chocolate to release from the mold, and when you try to clean it up with the tooth pick, the whole piece of colored chocolate will pop right out. And then you will cry, and have to start all over. This is what the outside of the mold looks like after the inside has been painted. 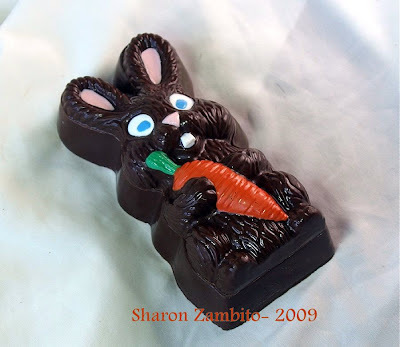 Then fill both cavities with melted chocolate in the color of your choice. Make sure the chocolate is cool to the touch. If it is too warm, it will melt your colored accents and they will run and smear. And then you will cry, and have to start all over again. Edited to clarify: The above mold is the 2 pieces of the box. One side is the top, and the other side is the bottom part of the box with the cavity for the candies already in there. When you unmold it, the 2 pieces come out as you see in the finished product. I apologize for not getting a photo of the bottom part of the mold empty. 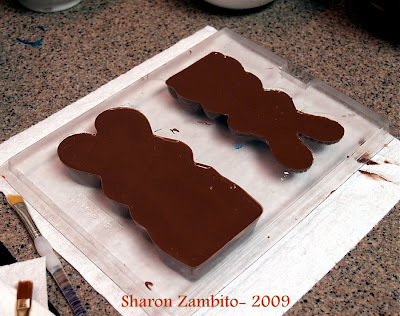 I put it in my freezer for 12-14 minutes, and then the 2 pieces come right out of the mold with a gentle tap. Let them come to room temp in cool room before you touch them. If not, you will get finger marks on the condensation you will not be able to repair. Then you will cry, and have to start all over again. 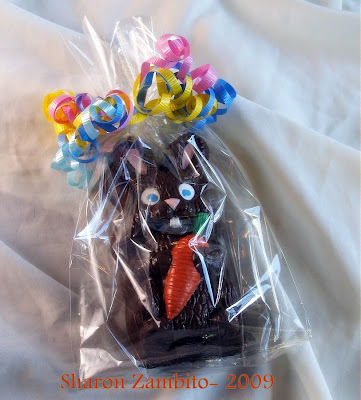 All packaged up and ready to be delivered by the real Easter Bunny.